PC release notwithstanding, Batman Arkham Knight was a solid entry in the franchise. And it seems that it’s getting the inevitable game of the year re-release treatment. 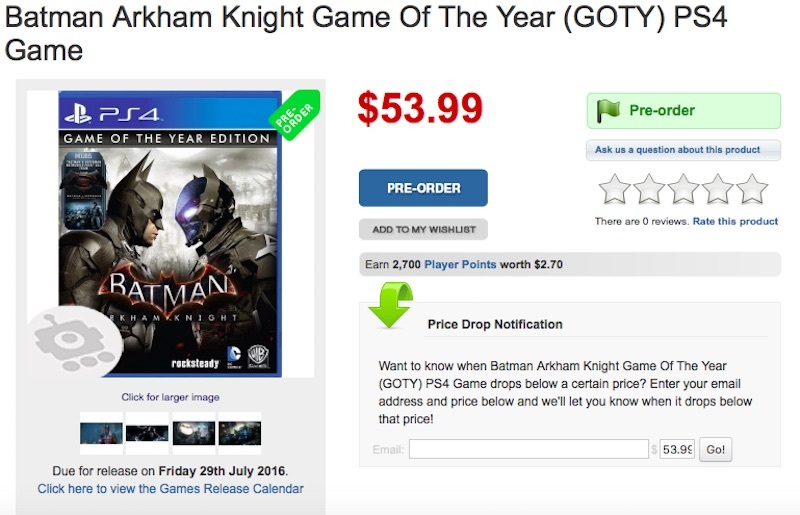 According to Australian retailer Ozgameshop.com, you should be able to purchase Batman: Arkham Knight Game Of The Year Edition next month, July 29 to be precise. While the date seems off what with Batman: Return to Arkham due a mere three days prior, the box art does not. Therefore, you can expect the Batman: Arkham Knight Game Of The Year Edition later in the year. And while the listing is short on details, you can expect it to come with all the downloadable content that the game eventually had. Or at least most of it, given that some was exclusive to specific retailers at the time. The price is a point of interest as well, at AUD 53.99 (approximately Rs. 2,680), you can expect it to be priced between Rs. 2,499 and Rs. 2,999 in India, which is pretty fair given the wealth of content on hand. Considering that Ozgameshop.com is one of the more reputable retailers around and that publisher Warner Bros has released game of the year variants of its past successes such as Batman Arkham City and Shadow of Mordor, we won’t be surprised to see this being officially announced sooner rather than later. In our review we found that Batman: Arkham Knight has more than enough to keep you hooked. Rocksteady claims that this is the final game in the Arkham series. While we find that hard to believe (and rightly so considering there’s a VR game in the works for PS VR’s release), there’s no better way to end it than with a game like this. Just don’t expect a PC version though. For obvious reasons.